“Doing business without advertising is like winking at a girl in the dark. You know what you are doing but nobody else does.” This quote is attributed to the marketing specialist Stuart Henderson Britt, highlighting just how important targeted marketing initiatives are in the success of a company. No matter whether we take as an example an innovative product or a new service, without a suitable marketing strategy and customer contact, consumers have difficulty in tracking down market newcomers and quickly forget even the most established product offerings. Marketing experts around the world work to ensure that potential clients are actually aware of the products and services offered by companies. In the face of new communication channels, global markets and increasingly varied customer demands, this is evidently no walk in the park. Marketing executives are confronted by numerous challenges, with maintaining their firm’s competitiveness their primary concern. If there were a to-do list for marketing experts over the coming five to ten years, the issue of maintaining competitiveness would be right at the top. It is regarded as by far the most significant challenge for the future: more than one in two respondents in Germany opined that it is a factor to which special attention must be paid in future. This is a finding of the “Marketing Challenges 2016” study, for which sales and marketing executives in Germany were again interviewed in November this year in addition to their UK-based counterparts for the first time. Companies which employ a minimum of 50 staff from a total of nine different industries were included in the study. 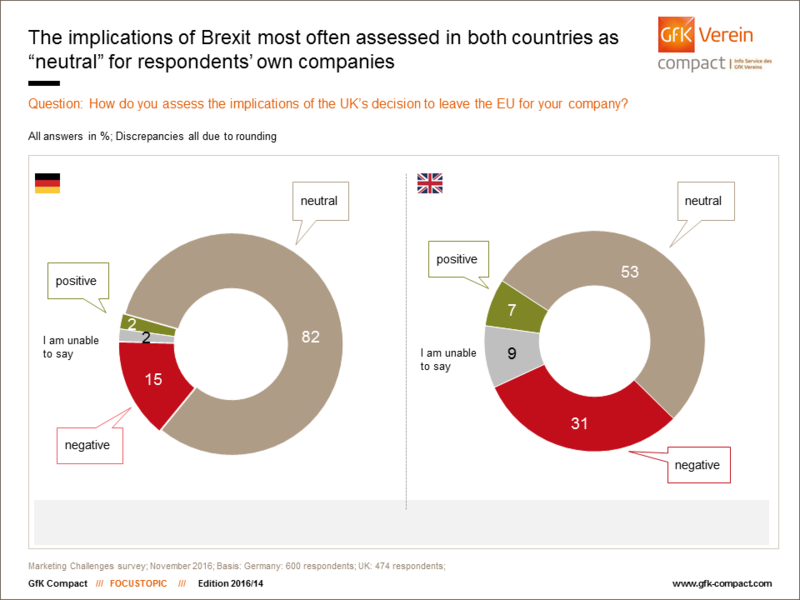 The marketing executives also assessed the implications of Brexit for their companies within the scope of the study. In our hectic, fast-paced modern society, how are innovative products and services developed? How can companies keep pace with technological change? How can they adapt to a business environment in constant flux? All of these aspects play a role in determining competitiveness. This factor was regarded as particularly important across all nine industries included in the study. However, in some sectors, respondents underlined the importance of competitiveness even more frequently than in others. In this regard, marketing executives from manufacturing companies are more concerned about this topic, as well as their colleagues from the hospitality industry, services sector and retail (including the automotive industry). Worries related to the economic and demographic landscape (key phrase: shortage of specialists) follow some way behind in second place (39%). Each year, companies must devise ever more ingenious schemes to fill vacant posts and make their firm attractive to applicants. These aspects above all occupy the thoughts of representatives from the construction industry, the health and social care sectors and gastronomy – in the fight to secure the brightest minds, these industries seem to struggle more than most. This is probably because they are sectors which demand hard work but often without the salary to match. A company website, customer portal or public blog – for some time now, online resources such as these have no longer been the exclusive domain of large companies. They have now almost become “must haves” for all SMEs. The possibilities offered by online communication channels have revolutionized the whole concept of customer contact from the ground up. Moreover, new challenges related to data security have also arisen as a consequence of this. In this respect, one fifth of German marketing executives consider the internet in their “to-do list of the future”. Nearly as many respondents have customer service in a more general sense on their minds. There are numerous examples revealing the extent to which political decisions can impact the success of a company: Germany’s nuclear power phase-out policy has changed the face of the energy industry, political reforms have flipped the tables on the healthcare system and monetary policy has always exerted an influence over the way banks, insurance companies and real estate firms conduct business. These industries are also those for whom the political status quo bears the most relevance when we consider future challenges. Of all the marketing executives surveyed, 17% named this aspect in their responses. Of similar significance (16%) is the influence of international competitors; above all (other) service providers are worried by how they can hold their own in the face of global competition. When it comes to respondents’ answers on the most significant challenges for the coming years, the subjects of sustainability and globalization account for 7% each, with corporate identity and branding lagging behind slightly at 5%. 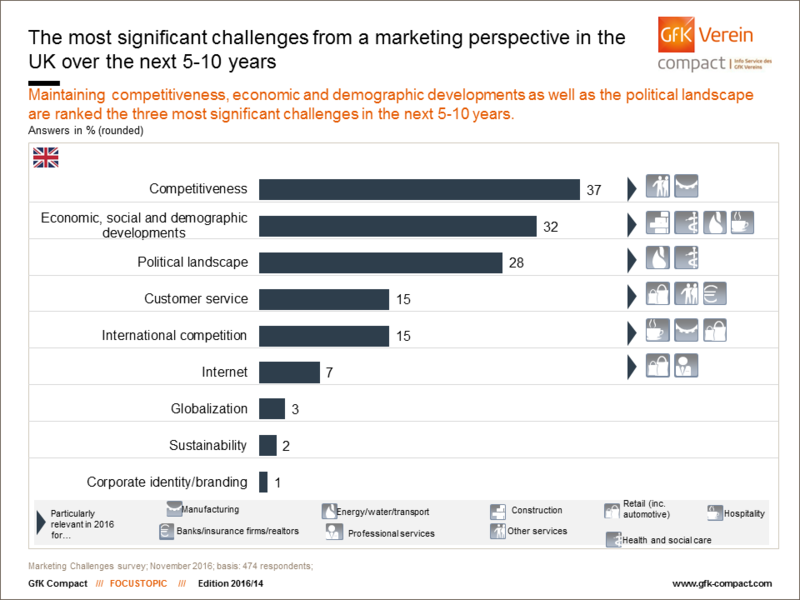 In comparison with 2013, some challenges have become even more pressing from a marketing point of view: While competitiveness in addition to economic, societal and demographic developments were also at the top of the rankings three years ago, they were specifically named by respondents far less frequently at this time. The challenges for companies presented by the internet were also mentioned by only half as many respondents back in 2013. However, in a time comparison, both the middle ground and lower reaches of the rankings have remained essentially unchanged. It can take years for a new word to be included in the Duden dictionary, the foremost authority on the German language. This year, an artificial word took hold in no time at all: Brexit. The term represents a turning point in the history of the EU and will no doubt have political, economic and social ramifications for years to come. The uneasy times since the Brexit referendum have already started to leave their mark in the consciousness of the British public, as is shown by a glance at the survey findings from the UK. Here, the political landscape is evidently a greater concern for companies than is the case in Germany. A total of 28% of marketing experts believe political developments will be a huge challenge for the future. This puts the issue in third place in the rankings of the most important future issues. Economic, social and demographic changes were cited slightly more frequently, at 32%. The shortage of specialists also plays a decisive role in the UK – as it does in Germany too. However, as is the case with their German counterparts, marketing executives in the UK are similarly occupied by the issue of competitiveness. In this regard, 37% of UK respondents believe this to be the most significant task facing their industry over the next five to ten years. 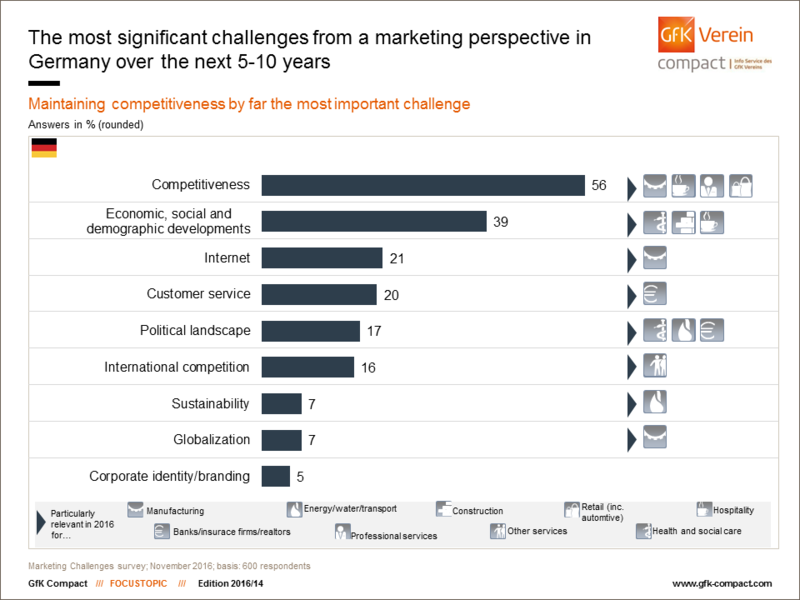 Similar themes to those from German respondents – albeit not necessarily in precisely the same order – can be found in the middle range of the UK rankings: 15% of respondents expect customer service and international competition (fourth and fifth place respectively) to be key challenges. Just 7% of British respondents are concerned by the changes brought about by the internet. On this subject, British marketing executives evidently feel better prepared than their German colleagues – or perhaps they have more pressing concerns than the digital transformation. However, globalization, sustainability and aspects surrounding corporate identity are not among these. Similarly to Germany, these particular challenges can be found in the lower reaches of the rankings in the UK as well. Just how the UK’s withdrawal from the EU will affect companies on each side of the Channel remains to be seen. However, not many expect the situation to develop positively for their own company – both in Germany and in the UK. In Germany, just 2% believe that Brexit could be something of a blessing in disguise, while the corresponding value in the UK is 7%. withdrawal from the EU – however, this majority is far smaller. Overall, 53% expect that not a great deal will actually change. The remaining respondents – 31% – anticipate negative consequences, above all in relation to imports and domestic sales markets. It is primarily the retail and hospitality sectors which feel under pressure following the outcome of the referendum. Manufacturing companies above all share this outlook in Germany. They form part of the 15% who fear that Brexit may well have unpleasant consequences for them. Marketing – where is the industry heading?